These leaflets are also available from Beastrabban. 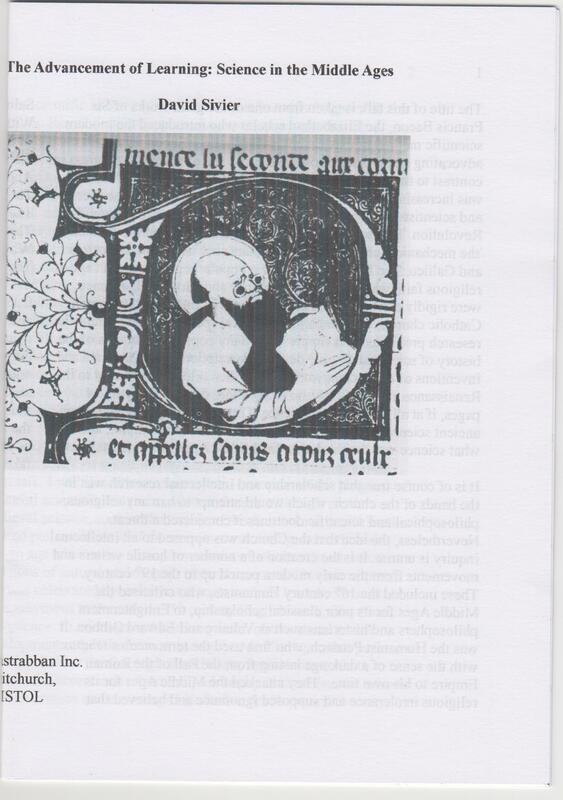 A very brief introduction to the subject, this pamphlet shows that although science in the Middle Ages was in the hands of the Church and was subject to religious pressure, nevertheless from the 12th century onwards the medieval West was certainly not against science. Medieval scholars took a delight in science and medicine. Far from being stagnant, this was an age of scientific and medical discovery. 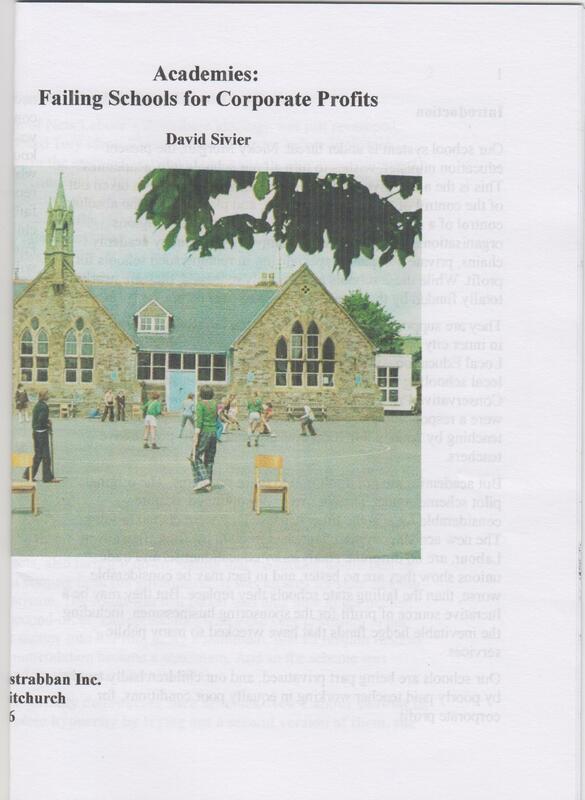 Academies: Failing Schools for Corporate Profits, David Sivier, A5, 14pp. This criticises the government’s campaign to convert British state schools into academies. It’s ultimately based on the City Technology College schemes that were piloted by Kenneth Baker under Margaret Thatcher, but then discontinued. The scheme was then revived in 2000 by Tony Blair’s Labour party as City Academies. Academies are no better than state schools, and many are very much worse. Where they succeed, it is merely because far more money has been spent on them than on schools under the management of the Local Education Authority. Placed under the management of private corporations, they are a part-privatisation of the British education system, and threaten a return to the educational situation before the 1944 Education Act made secondary education for all free and universal. A system where the mass of ordinary people were expected to learn practical trades, and academic education reserved for the wealthy few, who could afford to go to Grammar schools, or fortunate enough to pass the 11 plus. 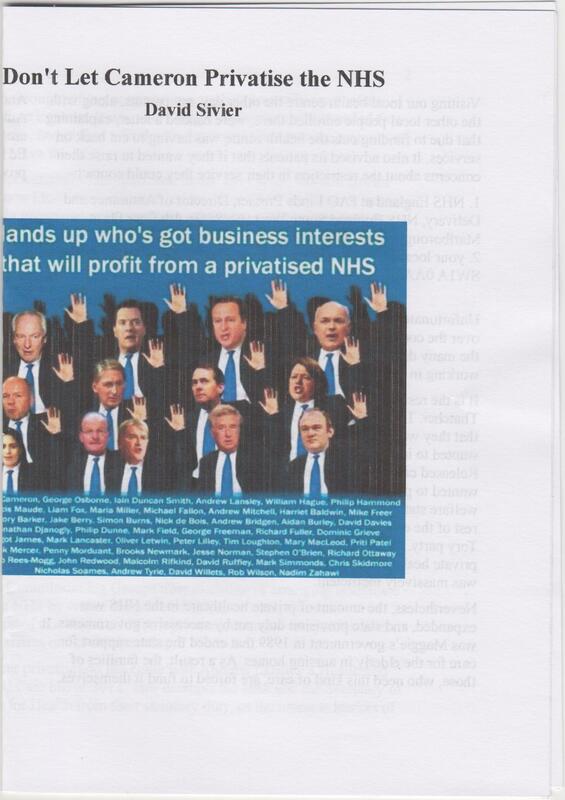 Don’t Let Cameron Privatise the NHS, David Sivier, A5, 10pp. This is a brief critique of successive government’s gradual privatisation of the NHS, beginning with Margaret Thatcher. Tony Blair’s New Labour were determined to turn as much healthcare as possible over to private companies, on the advice of the consultants McKinsey and the American insurance companies. The Conservatives under David Cameron have continued and extended Blair’s privatisation, so that there is a real danger that the NHS, and the free, universal service it has provided for sixty-five years, will be destroyed. If the NHS is to be saved, we must act soon. 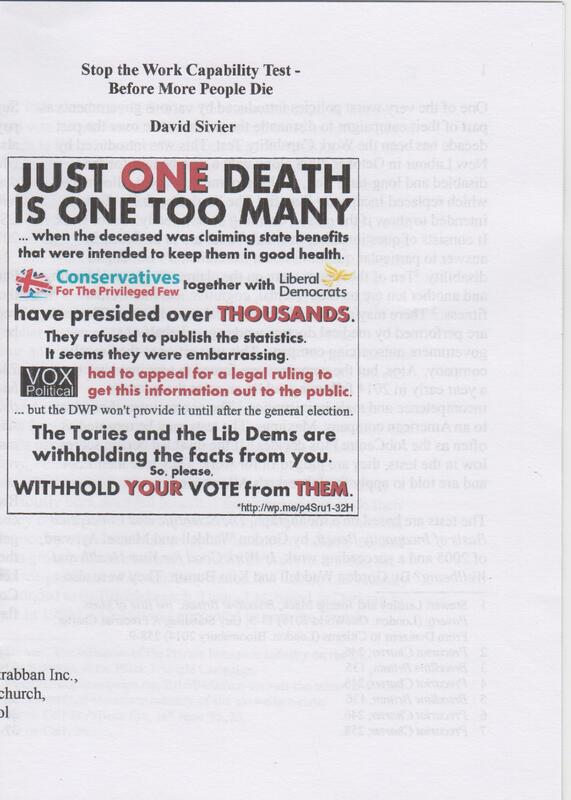 Stop the Work Capability Test – Before More People Die, David Sivier, A5, 7pp. This short leaflet criticises the Work Capability Test for those claiming benefits for disability or long-term illness. They were introduced by Tony Blair’s New Labour on the advice of the American insurance company, Unum, which was later found guilty of refusing to pay out on its plans to many thousands of disabled Americans. The tests are based on a flawed model of illness, and falsely assume a massive amount of malingering. They are therefore designed to make it as difficult as possible to qualify for benefit, under the assumption that the disabled person may still be fit for some kind of work. Thus, thousands of people have been thrown off benefit and forced to apply for jobseekers allowance, even when they are far too sick to work. 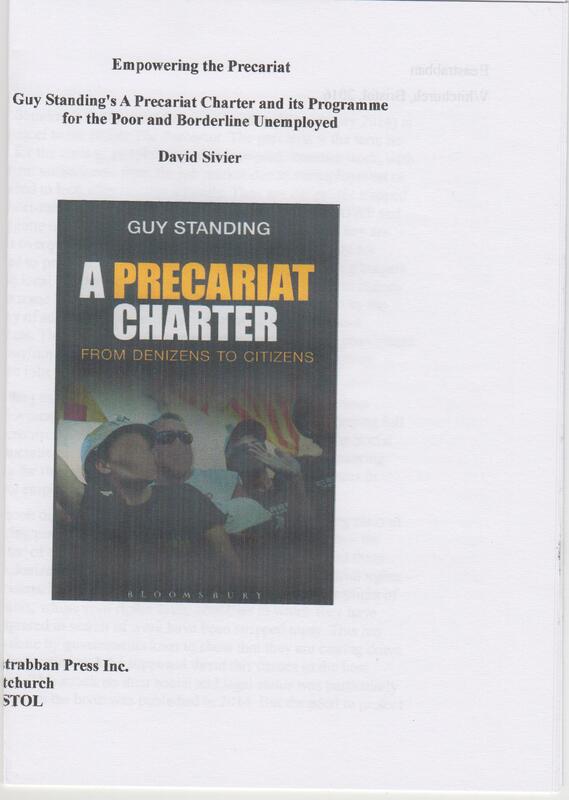 This has scandalously included the terminally ill.
Empowering the Precariat: Guy Standing’s A Precariat Charter and Its Programme for the Poor and Borderline Unemployed, David Sivier, A5, 12pp. This is a very brief introduction to the ideas in Guy Standing’s A Precariat Charter (London: Bloomsbury 2014). Standing is a political scientist, who believes a new class has arisen, the precariat. These are often highly educated people, who are forced into low-grade work, and whose careers are marked by periods of involuntary unemployment. These are the many people kept in poverty and anxiety through zero hours contracts, short-term contracts, and other aspects of the flexible labour markets, as well as government cuts and welfare policies, such as benefit sanctions, workfare and the work capability tests. They also include global migrants seeking work elsewhere around the world. He argues that this has class has been stripped of its rights, so that instead of being citizens, they are merely denizens – inhabitants of a nation without the rights of citizenship. His book is important, as it includes his programme to combat poverty and restore citizenship by attacking the employment policies and attacks on the welfare state pursued over the last thirty years by governments from Thatcher onwards. End Workfare Now! 19 pp, A5. This is an attack on workfare, the system of mandatory labour the long term unemployed may be forced to perform in return for continuing to receive their benefits by the DWP and the Jobcentres. The pamphlet argues that the system is unjust, it acts not to benefit communities, but private industrialists, like Sainsbury’s, Asda, Homebase, Poundland, and the other for-profit companies exploiting workfare labour. It does not lead to secure, lasting jobs, nor provide skills, and indeed may actually prevent people from finding work. It also drives down wages, and throws permanent workers out of their jobs. It is also similar to the forced labour system used against the unemployed in 17th century Britain and France, the notorious workhouses of 19th century Britain, the Labour colonies set up for the unemployed by Sidney and Beatrice Webb, and the forced labour systems of the Nazi and Communist regimes. 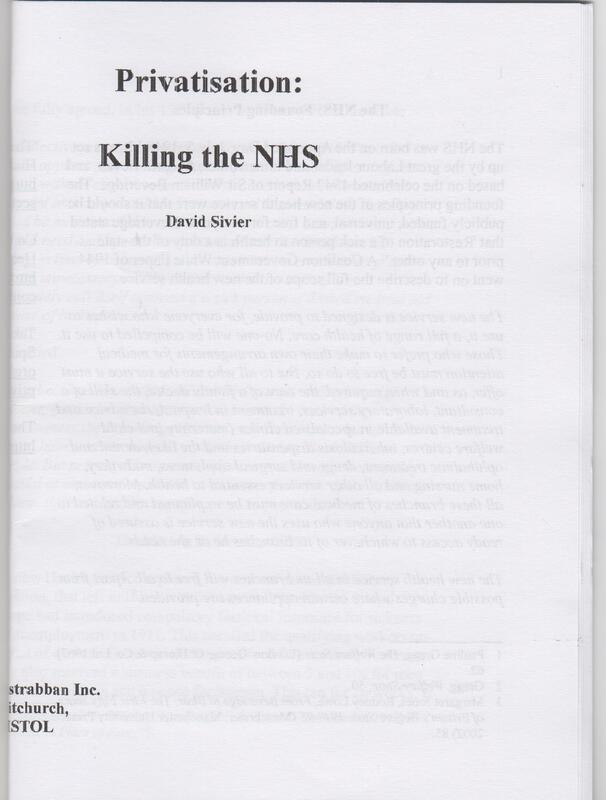 Privatisation: Killing the NHS, by David Sivier, A5, 34 pp. 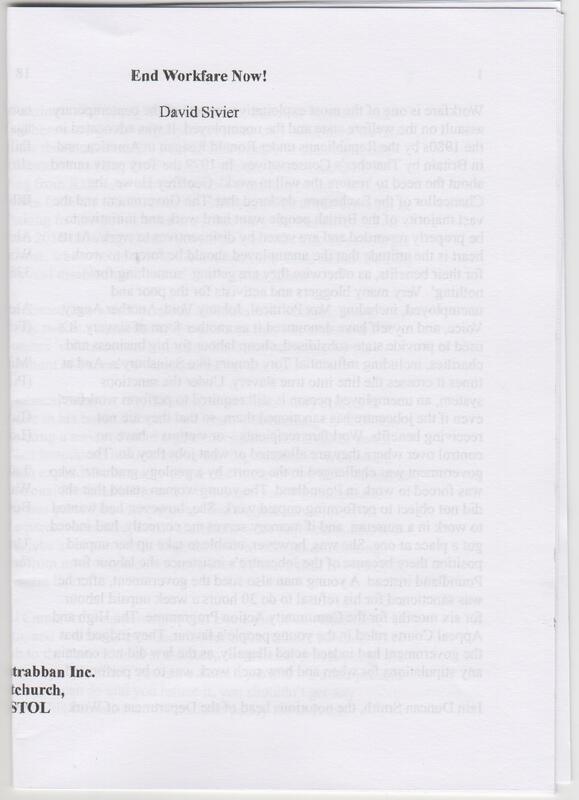 This is a longer pamphlet against the privatisation of the NHS. It traces the gradual privatisation of the Health Service back to Margaret Thatcher in the 1980s, John Major’s Private Finance Initiative in the 1990s, the Blair and Brown ‘New Labour’ governments, and finally David Cameron and the Conservatives. There is a real, imminent danger that the NHS will be broken up and privatised, as envisioned by Andrew Lansley’s, the author of the Tories’ Health and Social Care Act of 2012. This would return us to the conditions of poor and expensive healthcare that existed before the foundation of the NHS by the Clement Atlee’s Labour government in 1948. Already the Tories have passed legislation permitting ‘healthcare providers’ – which include private companies – to charge for NHS services. The book is fully referenced, with a list of books for further reading, and organisations campaigning to preserve the NHS and its mission to provide universal, free healthcare. If you would like one of the pamphlets, please get in touch using the contact form below. All details will of course be kept strictly confidential, and will not be passed on to third parties. If you only want single copies of the above, let me know and I’ll post them free to you.